Infosys drags markets down. With infosys lowered its dollar revenue guidance for the current fiscal, the stock markets closed lower on Monday. There is heavy profit taking is seen in the IT pack, while metals extended gains taking global cues. Mumbai: With infosys lowered its dollar revenue guidance for the current fiscal, the stock markets closed lower on Monday. There is heavy profit taking is seen in the IT pack, while metals extended gains taking global cues. 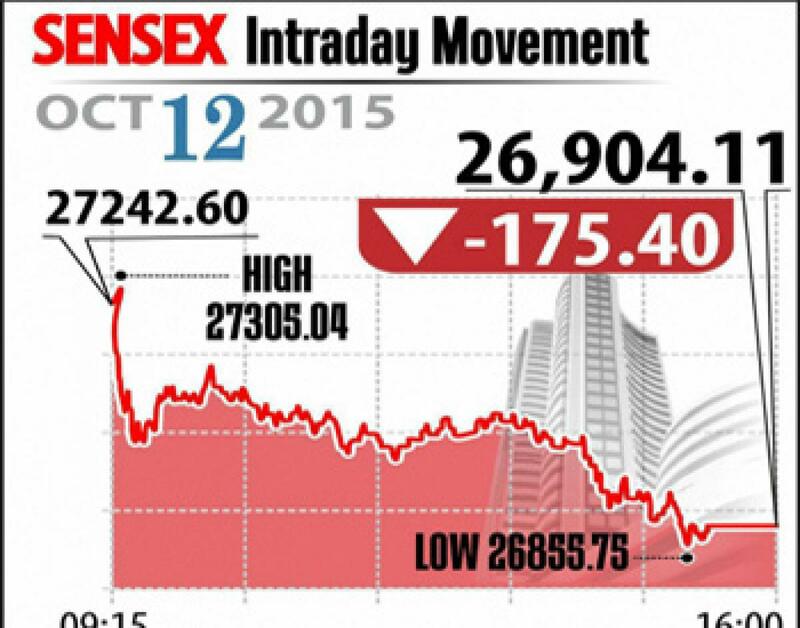 Sensex ended down 190 points at 26,889 and Nifty closed lower 46 points at 8,144. The broader market performed flat with midcap index closed up 0.2 per cent and smallcap index ended flat. Experts say the market turned volatile and profit booking is becoming order of the day. However, they feel there would more upside in the near term as FII investment is flowing into the market. On the sectoral front, IT index was the top loser down over 2 per cent, followed by healthcare and FMCG indices, while metal and power stocks are major gainers. From FMCG pack, ITC and HUL closed down up to 0.7 per cent each, while pharma stocks including Lupin, Sun Pharma, Dr Reddy's and Cipla closed down up to 2 per cent. Vedanta continued rally up 7 per cent, another stock Hindalco gained 6 per cent. Also Tata Motors gained nearly about 2 per cent. The gainers: Vedanta, up 7.00 per cent at Rs 110.85; Hindalco Industries, up 5.98 per cent at Rs 88.65; Gail, up 2.49 per cent at Rs 319; Tata Motors, up 1.83 per cent at Rs 362.40; and BHEL, up 1.76 per cent at Rs 205.60. The losers: Infosys down 3.88 per cent at Rs 1,122.50; Lupin, down 2.16 per cent at Rs 2,011.65; Cipla, down 1.71 per cent at Rs 676.35; Sun Pharma, down 1.58 per cent at Rs 892; and HDFC, down 1.44 per cent at Rs 1,272.10.